Add to your Ryobi ONE+ power tool collection with an 18V battery. You'll love the versatility and convenience offered by this entire range - with one battery, you can power more than 50 Ryobi power tools. Lithium batteries are handy around the workshop - they have a long cycle life and high energy density, giving you more charges and better output. These Ryobi 18V batteries have a helpful charge indicator so you can see when you need to recharge - you won't have to worry about being caught out halfway through a job with one of these in your tool shed. Overload protection, deep discharge protection, temperature control and individual cell-monitoring also add to make these batteries safe and practical. 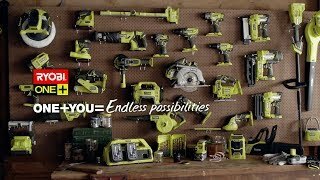 Whether you're drilling, cutting or blowing, in the yard or workshop, you should power your Ryobi ONE+ power tools the right way. Pick up your 18V lithium+ battery from your nearest Bunnings Warehouse today.